The Devil's Fork Loop Trail provides an impressively beautiful route through an old-growth hemlock and rhododendron forest. Amazing rock formations, waterfalls, swimming holes and mountain views give you plenty to see and do, but keep one eye on the trail, as the going can be rough. 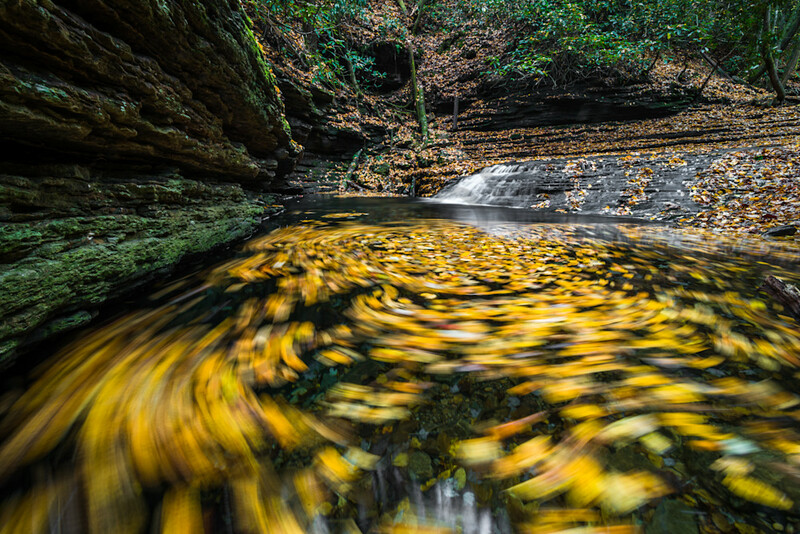 The trail's main attraction is Devil's Bathtub, located just 1.5 miles from the start. The rushing water of Devil's Fork shoots out of the soft sandstone and swirls quickly through this stone luge, plummeting into a beautiful pool of blue-green water. Another trail highlight, shortly after Devil's Bathtub, is the 50-foot waterfall at the mouth of Corder Hollow. The trail enters a very different landscape as you leave the Devil's Fork and begin hiking along the ridges of several mountains. The forest has little underbrush and the path can be easily lost. Your adventure concludes on an old logging road with about a mile of steep switchbacks to the loop's end, where you cross Devil's Fork for the last time. There are primitive camping facilities near the parking lot. You can continue hiking by taking the Straight Fork Ridge Trail (1.8 miles) via the parking lot. The scenery on Straight Fork Ridge is similar to the Devil's Fork Loop Trail, but the latter is considered the more interesting of the two trails.